When proper headwear is required, nothing beats a true classic like the American baseball cap. Our Ezycaps Impact Baseball Cap is a regular characteristic headwear and it features a five-panel structure which allows great printing and decorating options for your logo or marketing idea. Great for outdoors, the Ezycaps Impact Baseball Cap is a soft cap with a stiff bill eye-shade in front and a rounded crown for all head sizes. The cap can effortlessly fit to the wearer’s head size, as the back side provides flexibility and it has a Velcro adjuster that may be modified to fit many different head sizes. The main promotional feature is that the baseball cap can also be used for printing any logos or pictures on the cap’s surface. Typically containing sports team logos and baseball teams, the cap also utilizes logos for companies, businesses, and any other types of logos you wish to have printed on the side. The padded sweatband and 100% polyester material make sure the cap is durable and flexible enough for any wearer, while the five-structured panel design and Velcro fastener ensure stability and comfort. The peak is also pre-curved and the embroidered eyelets guarantee nothing but high-quality headwear. Of course, the baseball cap is an essential part of a traditional baseball uniform worn by players, as a classic American pass-time. Nobody can resist its traditional look and feel. The brim shields the eyes from the sun and the cap is often seen as an essential part in everyday casual wear as well as sports uniforms. 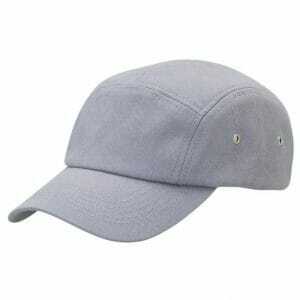 Throughout history, the baseball cap has had its ups and downs and peak popularities in different eras. In 1860, the baseball legends Brooklyn Excelsior’s wore a typical prototype of the modern rounded-top baseball cap. It was later popularized as “The Brooklyn Style” cap around the beginning of the 20th century. Later, flexible material such as latex rubber was used for the stiffening texture for the inside of the cap around the 40s, and thus, the modern baseball cap has cemented its look and feel to this day. For better eye protection and shading, the “bill” or “brim” was specially designed for the baseball players, ensuring shade from the pesky sunlight not to ruin their vision or concentration. Back in the early days of baseball, the brim was much shorter and throughout the ages the baseball cap became more complex and sturdy, as the structure has changed over the years. It is still an important part of the modern day baseball uniform and, above all, it is a staple of recognition and symbol for a baseball team, as the logo was placed right on the cap, be it the mascot, or the main team’s symbol. Usually, the caps were painted in the original colors of a specific baseball team, but now, the basic shape, including the bill and backside, are similar to the 19th century versions of the cap. The Ezymugs Impact Baseball Cap is available in black colour. Today, baseball caps are made of various materials, textures, and shapes, and are used for many different purposes. Golfing, fishing, trucking; all of these professions and hobbies are always in need of a high-quality baseball cap for many functions. It is important to mention that major and minor league baseball players wear the classic version of the wool baseball caps, but they can sometimes utilize a more flexible material such as polyester to be used for their team’s logo and symbol. The Ezycaps Impact Baseball Cap is absolutely perfect for gifting, and for your many promotional uses, as the prints will not fade away, ensuring your company’s or sports team’s logo will remain visible and recognizable by your clientele. If you are searching for the perfect cap for any promotional purpose or marketing and corporate use, look no further, for the Ezycaps Impact Baseball Cap offers nothing but sheer quality, durability, style, and a classic American look.